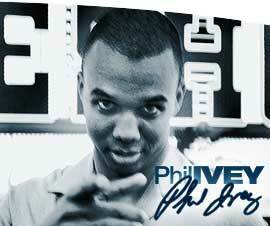 To most people Phil Ivey is considered the best player in the world. Even to those that disagree he would be in their top 5 list for sure. This is an incredible achievement considering the fact that Phil is still in his thirties, and that since bursting onto the scene in the 2000 World Series of Poker, he has collected an impressive collection of titles including 9 WSOP bracelets. To this day Phil Ivey remains one of, if not the most feared opponents in the game, with an aggressive game and his trademark piercing eyes and stare. Phil has two nicknames, the first being “No Home Jerome” which he earned during his time in Atlantic City playing cards whilst under age using the alias Jerome. The second is “The Tiger Woods of Poker” due to his close resemblance to the golfing great and that like Tiger in Golf, he is probably also the most successful poker player. 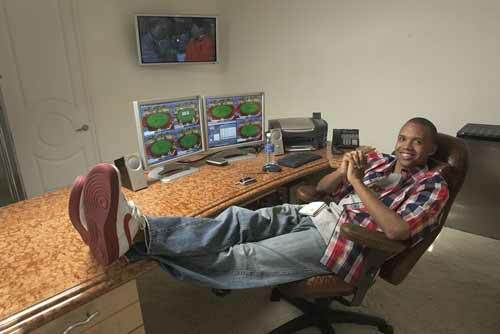 Phil Ivey was born in 1976 in Riverside, California but shortly after he and his family moved to the other side of the U.S to Roselle, New Jersey. In his childhood days Phil would play poker with his grandfather who taught him how to play, and it became a real interest for him. While Phil was still at high school he would play in adult poker games and wipe them clean, but he continued to try to improve his game and master what was becoming a big part of his life. Despite being under age, at the age of 18 Phil began to go to Atlantic City under the alias of Jerome and his fake I.D. During the next few years and the late 90′s Phil continued to play at Atlantic City building a serious bankroll and working on improving his game. At the age of 21 Phil, who was still known to all the poker community in Atlantic City as his fake I.D alias of Jerome apologised to all his friends and the management at the casino and revealed that he was not really Jerome, and from that day on he began to be known under his proper name. Little did he know that in a few years time the name Phil Ivey which he had spent so much effort hiding would become one of the biggest worldwide brands in poker. Ivey first burst on to the professional poker circuit in 2000, when he took his game which he had been mastering for the previous few years to the World Series of Poker, the biggest series of poker tournaments held each year in Las Vegas. He made an immediate impact winning his first WSOP bracelet in the Pot Limit Omaha event and in doing so defeated two poker legends at the final table in Phil Helmuth and Amarillo Slim. This would be the start of a successful WSOP career and he has gone on to win many more bracelets with his total currently standing at 9 bracelets. This puts him 4th in the overall WSOP standings with only Phil Helmuth, Doyle Brunson and Johnny Chan ahead of him, all of which were playing the WSOP way before Ivey started in 2000 with Brunson being involved from the start in 1970 and Chan / Helmuth from the 1980’s. He has also done well in the WSOP main event over the years and finished in the top 25 in three recent years in 2002, 2003 and 2005 which considering the starting field for the main event in these years was anything up to 5,000 is a remarkable achievement. He went even closer in 2009 when he beat 6,494 players to reach the final table and went on to finish 7th for a payday of $1.4 million. To go so deep in the main event over and over again when the fields are so large is an amazing achievement. After his WSOP win in 2000 Phil began to play in the big cash games in Las Vegas. He became a regular at these games and today he continues to play in the now famous “Big Game” at the Bellagio in Vegas where players can win or lose millions in a night. He is also a regular at the cash games in Macau, China, where the stakes are rumoured to be the biggest in the world, with millions of dollars changing hands in each pot. Phil has collected $17.6 million in career tournament winnings including all his WSOP wins but also a $1million win in the Monte Carlo Millions tournament and a $600k win for the Full Tilt Poker Invitational which amazingly he won just 24 hours after the Monte Carlo win. Of course the above figure does not include any cash game winnings and although there is no record of this it is likely to make his tournament winnings look like small change. 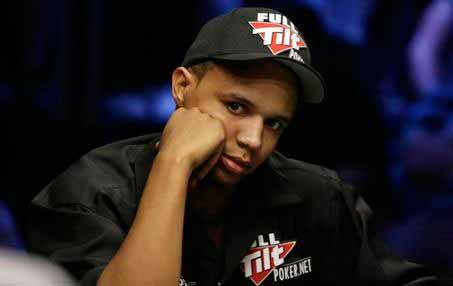 Phil Ivey was a pivotal part of Team Full Tilt and the growth of the company in it’s early years. He was an original shareholder in the company and probably the most well known and followed member of Team Full Tilt which promoted the poker room and drew millions of players to sign up with the room. In 2011, Full Tilt was under all sorts of pressure due to the events of Black Friday and not having enough cash in the bank to fund the rush by players to withdraw their account balances. It was during this time that Ivey filed a lawsuit against Full Tilt attempting to end his relationship with the company and in particular the “non-compete” clause which prevented Ivey from promoting any other company. The reason for the lawsuit was because the other owners of Full Tilt would not allow him to break his non-compete clause whilst still an owner of the company. Ivey claims that the lawsuit and events surrounding it were because he no longer wanted to be associated with a company with so much bad press and unable to repay players, however other owners and cynics suggest it was more likely that Ivey wanted to launch other business interests such as his current venture IveyPoker.com a social poker game. Along with all the other owners of Full Tilt Poker, Ivey was forced to surrender all his interests in the assets of Full Tilt Poker in order to facilitate a rescue package by new parent company Pokerstars which ensured that all players were paid back their player balances. this was a huge hit to Ivey and the other owners considering that prior to Black Friday, Full Tilt Poker carried a $1billion valuation. 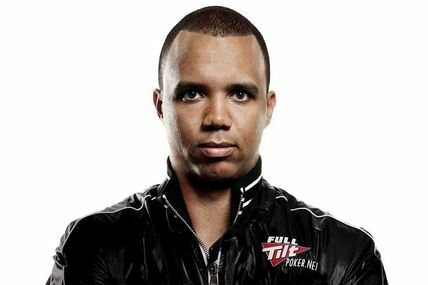 If you see this avatar on Full Tilt Poker then you are playing with Phil Ivey! Ivey has come through this bad publicity patch relatively well and remains a fans favourite and continues to enjoy incredible success at the poker tables. He still plays online poker and you can watch him playing in some of the biggest cash games on the internet on the relaunched Full Tilt Poker under the stewardship of new owners Pokerstars, the largest poker operator in the world. 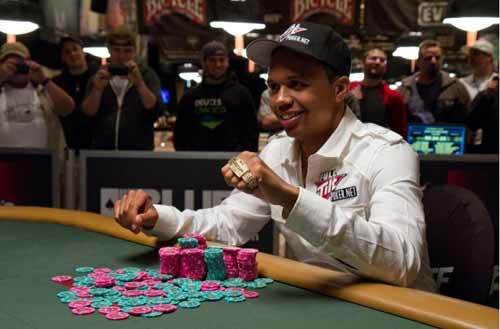 Want to Chat and Play Poker with Phil Ivey?